This group accommodation is located on the edge of the historical village Holwerd, on the Wadden coast in Friesland, in a 1850 farmhouse. The large recreation room with its own bar and various sitting corners is perfect for a cosy holiday with family or friends. The little ones will enjoy the play corner with TV. The apartment has a terrace at the front where you can relax with views on the Wadden sea. The village of Holwerd is characterised by the many fisherman's houses and narrow alleys and is located in the Wadden region amidst natural beauty and tranquillity. 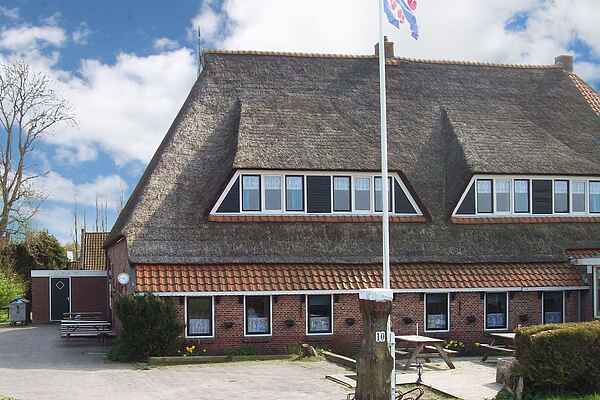 Besides its many opportunities for walking, cycling and farmers golf this group accommodation is perfectly suitable as a base for mudflat hiking ('wadlopen'). Mudflat hiking trips can be organised for groups staying in that accommodation. A day excursion to Ameland and Schiermonnikoog is good fun too. From Holwerd you can make the crossing to those Wadden islands. Pay also a visit to the walled city Dokkum (9 km). The inner city still exudes an historical atmosphere and there are many great pubs, restaurants and shops.